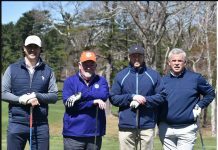 Sandwich Hollows Golf Club has been owned and operated by the Town of Sandwich since 1999 and recent course improvements has seen the tee sheet fill up on weekends and throughout the summer. 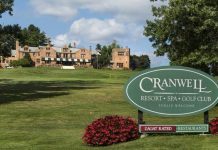 SANDWICH, Mass – Few regions in the country can compare with Cape Cod’s 27 public and 16 private golf courses, sometimes earning the sandy peninsula the moniker “the Golf Coast” because it is has become one of the top golf destinations in the Northeast. 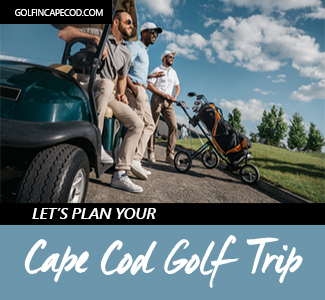 The 27 varieties of public golf on Cape Cod are found in all shapes and sizes and on any given day, Sandwich Hollows Golf Club, bought by the town of Sandwich in 1999, has been a haven for locals, winter golfers and bargain tee time shoppers for four decades. 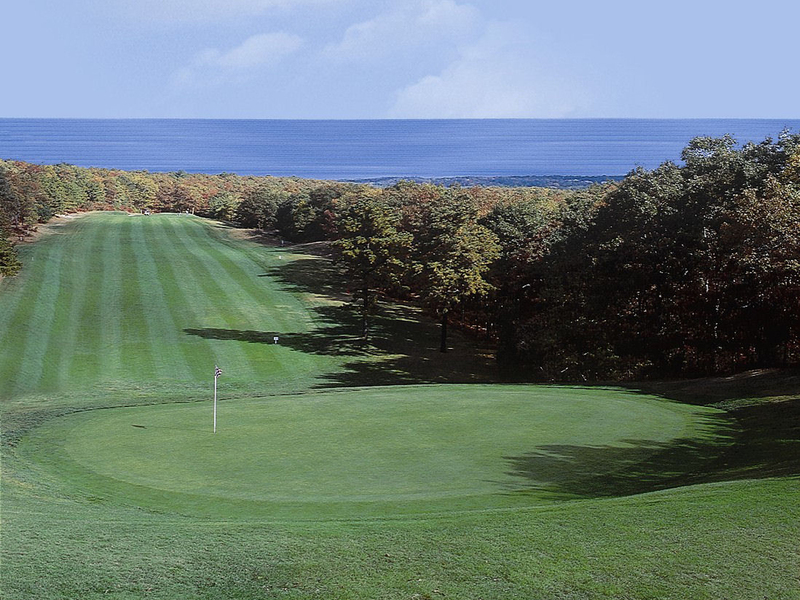 The no frills municipal course features great views of Cape Cod Bay to the north and is bordered by 1800 of acres of conservation area to the east, west and south. Each hole is unique and isolated from others and the town recently splurged with a $250,000 grant to improve several tees and closely-mown areas near the greens on the front nine. The original lay-out (once-named Round Hill) was carved out of the hills of Sandwich in the mid-70’s. 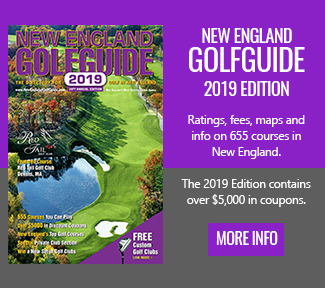 The 18-hole par 71 golf course was carved from 120-acres of rolling terrain with tree-lined fairways and some dramatic elevation changes, especially on the par 35 back nine. The property has no houses on its grounds and seems more like a venue set in New Hampshire or Vermont. Following a recent makeover by DHT Golf Services of Plymouth, the course now sports two newly remodeled tee boxes – each with three sets of tees, and 26 reconstructed sand traps for improved play and maintenance. 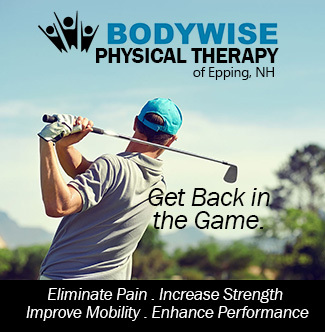 The lack of length is somewhat deceptive, as the layout and elevation changes will challenge golfers of every skill level. The blue tees play to 6,307 yards, the whites to 5,915, and the forwards to 5,124. Course ratings and slopes for the men are 70.4/122 for the blues and 68.8/120 for the whites, and for the women 73.8/124 for the whites and 70.7/121 for the forwards. 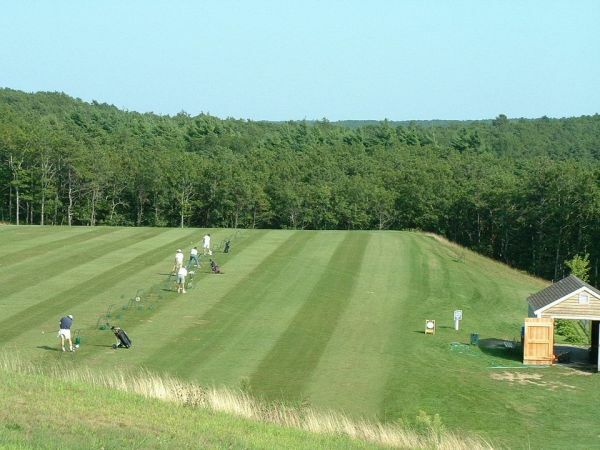 The practice range at Sandwich Hollows Golf Club is considered by many as one of the best on Cape Cod. 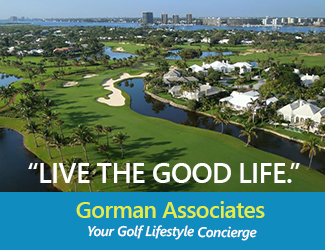 The golf course has narrow, tree-lined fairways that put a premium on accuracy. 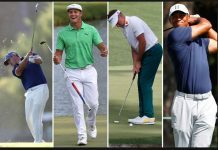 And, the greens are relatively small with their subtle curves and Stimpmeter speed of 8-9, that reward consistent putting strokes. One interesting observation about Sandwich Hollows is that that each nine is a totally unique golfing experience. A daily visit to Sandwich Hollows’ secluded practice range will find head pro Tom Tobey either working on his game or giving lessons. The practice range is located adjacent to the golf shop and 9th hole and features all-grass. Distractions or noise is not a problem when working on your game and it has five target greens with accurate distance markers to each green to assist golfers in their quest to improve. And that “tale of two nines” invokes the genesis of the course from the late 1960’s. 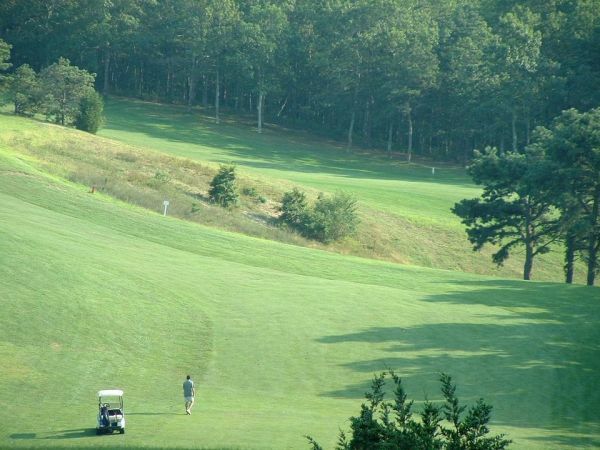 Sam Volpe, who owned a very successful construction business in Boston, constructed his own golf course within the hills of Sandwich and called it Round Hill after the name that the Wampanoag Indians had given to this soaring piece of land. When the architect that Sam Volpe hired had completed the front nine but delayed on the back, Volpe fired him and designed the back nine himself. Locals advise that it’s wise to walk the front nine and take a cart on the back nine—and make sure your seat belt is buckled for the upcoming roller-coaster ride that awaits. The dog-leg left par 4 seventeenth hole drifts downhill off the tee then hard-left and uphill making for a demanding approach shot. The front nine is an nice par-36 layout that is, indeed, walkable. 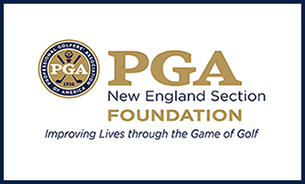 There are a few memorable holes: the par-5 first that can be reached in two; the short par-3 third that offers a scenic vista of Cape Cod Bay; the difficult par-5 sixth, and the uphill par-4 ninth. Just off the eighth tee, by the way, is the mausoleum where Sam Volpe and his wife are buried. Now to the back nine, where the roller-coaster ride begins on the tenth, a 370-yard par-4 that starts with an elevated tee and then goes straight downhill. 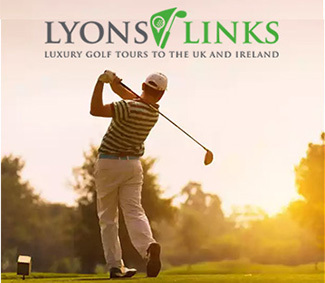 The eleventh might just be the most difficult hole on the course where problems exist from the tee to the incredibly sloping fairway all the way up to the elevated green. The final two holes are Sam Volpe’s most memorable creations: seventeen is a hard dogleg left that starts with an elevated tee to a severely sloping fairway and then ends, usually into the wind, with a celestially elevated green; eighteen tee is at the highest point on the course and looks 400 yards directly downhill to a green that is guarded by a huge oak tree planted 25 yards in front of it. Sandwich Hollows Golf Course is an unusual and fun course with exceptional pricing opportunities. On Wednesdays you can play all day with a cart for only $35. 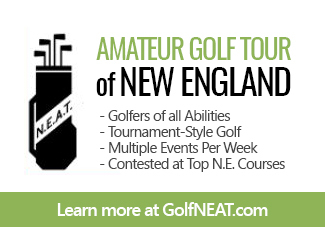 The annual golf memberships start at $300 for juniors, $600 for seniors and $800 for regular. The Sandwich Hollows Clubhouse Sports Bar & Grill – “where everyone knows your name” -attracts golfers and sports fans all year round to watch the big game, but especially during football season with free buffets and some friendly in-house betting pools for entertainment purposes only!